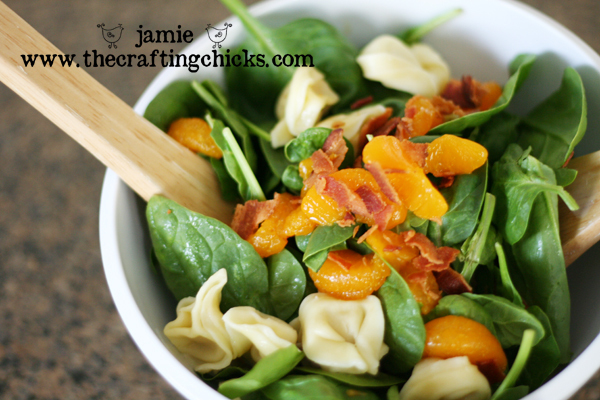 I LOVE this yummy Spinach Tortellini Salad, especially in the summer and just had to share it with you! I received this salad recipe at an exchange a few years ago and since then, I have made it many times-in fact I crave it often-especially when it is warm outside and I feel like eating a cool dish! 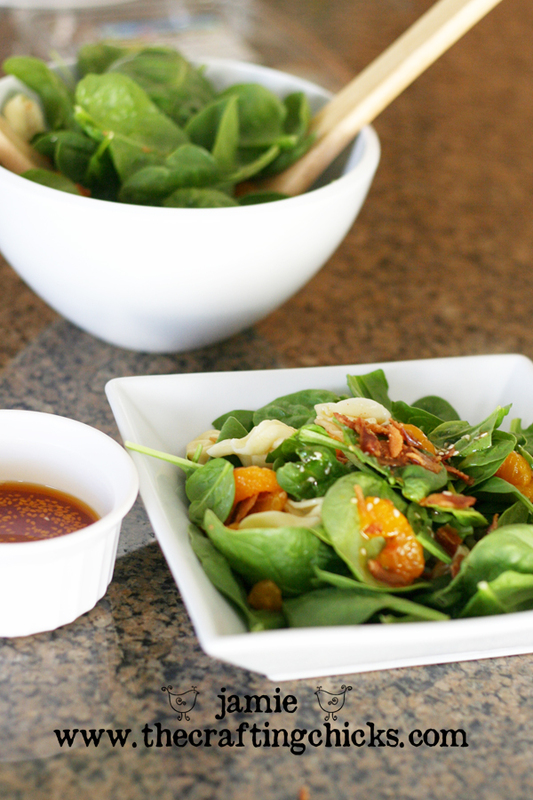 It is the perfect salad for a luncheon, or even dinner. And the dressing is tasty, tasty, tasty! The tortellini makes it even more filling and delicious! Before pouring the dressing on the salad, stir it really well. ENJOY! 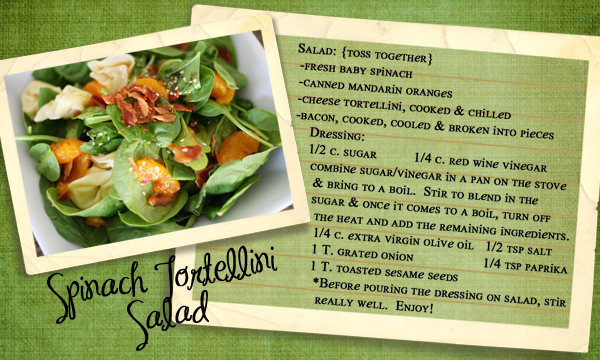 If you would like to print out the Spinach Salad recipe card below, click on the card and then right click. Select save or print. I was looking for babylegs tuitorial this week. This is perfect timing. I was also looking at a few of your posts. Do you have 2 sets of twins? Perfect pic of those babies btw. So cute. These pictures of twins in the hats and baby legs are sooooo darling. Gives me an itching for a set of twins! I love baby legs. They would be perfect for the little one joining our family this fall. great giveaway! I just love babylegs, they are super cute. My daughter would look darling in these baby legs! So cute! Thanks for the giveaway! Love , Love , Love the baby Legs, so cute. The picture above with both babies is priceless. I would love some baby legs for my kids. jamie! you know who REALLY needs those baby legs?! (or at least at least a friend to make them with this week…) by the way – the spinach salad IS awesome and i make it for my family all the time! i would love a pair! they are soo cute! Love the baby bears! That salad is still one of my favorites! I love baby leggings! My babies are no longer crawling, but my 2 1/2 year old wears them at night with night gowns and my 7 year old wears them as arm warmers! You have some very cute models!! That salad looks sooo good! I love the baby legs. I have a 2 1/2 month old who I am pretty sure is going to be an early crawler as he already is scooting across the bed. I have all hard floors so these are going to be a lifesaver for his poor little legs! I would love some baby legs for my little girl! I have been meaning to make some but just can’t seem to get around to it! Jamie, I love these, probably cheaper than buying the baby legs….. I want to try this. So cute!! That salad sounds so yummy! And the recipe card is adorable. But not as adorable as the cuties in the babylegs…I am addicted to those things btw – and am guilty of sparking many other mothers’ addictions after giving them as a shower gift! That salad looks so yummy! Looks like something you would order at a restaurant! Having my first baby in Sept. I sure would love to put a cute pair of babylegs on her! What an awesome idea. I have never heard of babylegs. My little one just started crawling last week and is already getting some rug burns on those little knees. These would be perfect, and so dang cute too. Cute babies! I would love a chance to win some baby legs for my little guy. And that salad looks great! Fab giveaway! I would love to win a pair for my sister in law’s baby girl she’s having in October…I’ve been gushing on about them and this being her first child I’ve been hipping her to all things cool for babies! I may even make that salad tonight! Yum!! Baby legs are the best, and those argyle ones are the cutest! mmm… that salad looks delish! Those are the cutest things EVER! I’d love a pair for my daughter! I’ve been wanting to make these too! i’d love a pair for my baby boy since we hope he’ll dtart crawling soon! How stinkin’ cute! I would love a girlie pair! Thank you for all of your fabulous ideas! My 10 month old little girl would LOVE these especially on our new hardwood floor and outside trying to follow her brothers around! I have three little girlies and absolutely love Baby Legs! I have never heard of Baby Legs before. They are so darling. I have a 9 month old boy who is just starting the army crawl. He would look great in a pair. I hope I win! Baby Legs seem awesome, I’ve never tried them out yet, but would love to! Also, the models are adorable! I’m new to your blog and love it! How cute!! I will definetly need those for my cute little baby that will be here in January!! 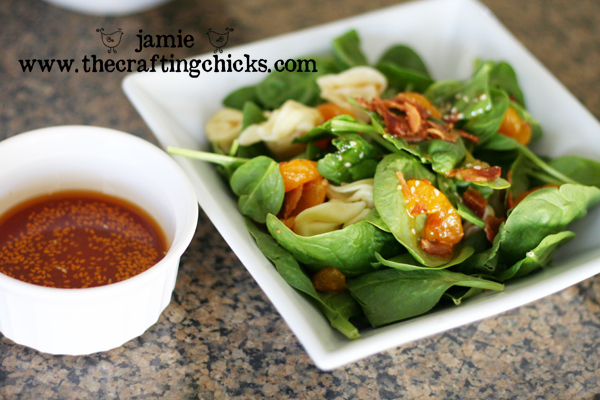 The spinach salad recipe was just added to this week’s menu! Can’t wait- yum. what a cute picture…both of them have the most beautiful eyes. that salad looks divine! it’s on my menu for later this week. those babies – eep! so sweet! Love your babylegs and your babies!!! How super cute! I will have to try making these for my little one who will be here in November. My littlest dude just started crawling and to go right along with that, I just started noticing poor little red knees. Even if I don’t win, I’ll be making some! Thanks for the idea! These are too cute. I’d love to see them on my little girl. oh man, i wish i had known about baby legs! my 9 month old has been crawling for months and has rug burn to show it! those are so stinkin’ cute! he could use them, and so could his baby brother or sister when he/she arrives! Those babes are too cute! Almost as cute as my little babe! 😉 I just LOVE baby legs. We had a couple of pairs for my daughter, but they are pink and very girly. Would love to have some “manly” (read: non-pink) ones for my little man. Thanks for the giveaway! So cute! My little girl needs some of those. I wish I were more crafty. Maybe over time. I have never even heard of baby legs! I have a 6 month old that is already a little mover, thanks for the tutorials. I would love these for my future crawler! So, so cute.